Funeral services for Dr. Paul Fink, former faculty member at Grace Theological Seminary and Liberty University School of Religion, will be at 11 a.m., Wednesday, September 11, at Thomas Road Baptist Church in Lynchburg, Va. Visitation will be tonight (Tuesday, September 10) from 6 to 8:30 p.m. at the Welcome Center on the campus of Liberty University. 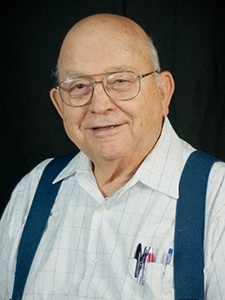 Dr. Fink died Saturday, September 7. He was professor of homiletics and pastoral theology at Grace from 1963-1979 and served as interim pastor at various Grace Brethren churches in Virginia over the years. To view photos of Dr. Fink’s life, to leave a memory, or to express condolences, click here. Dr. Paul Richard Fink, 83, of Madison Heights, went home to be with his Lord, Saturday, September 7, 2013, at Lynchburg General Hospital. He was the loving and devoted husband of Mary Louana Allen Fink for sixty-two years. Born February 6, 1930, in Tucson, Ariz., he was the son of the late Louis Phillip and Sula Frazier Fink and was also preceded in death by three brothers, Lloyd, Louis, and Glenn Fink. Dr. Fink was the Director and a Teacher of the Amherst County Bible Institute in Madison Heights, retired College Professor with the Liberty University School of Religion and Grace Theological Seminary in Winona Lake, Ind., and was a U.S. Navy veteran of the Korean War. He was a member of Grace Baptist Church in Madison Heights and also the Patterson Memorial Grace Brethren Church in Roanoke. In addition to his wife, Dr. Fink is survived by six children, Anne Marie Truax and husband, Jesse, of Salem, Catherine Joann Eubank and husband, Mark Steven, of Monroe, Mich., Dawn Renee Hite and husband Chris of Cheyenne, Wyo., Glenn Allen Fink and wife Sherrill of Richland, Wash., Jerry Lee Fink and wife, Lisa, of Forest and Gary Wayne Fink and wife, Leecy, of Madison Heights. Dr. Fink is also survived by twenty grandchildren, Kristen N. Truax, Jesse D. Truax Jr., Heather M. Truax, Allison K. Fink, Ryan E. Fink, Jerry L. Fink Jr., Spencer L. Fink, Dylan M. Bishop, Raven N. Bishop, Daniel Eubank, Rebekkah R. Eubank, Jonathan Eubank, Hannah Hite, Mary C. Hite, Julius C. Hite, Madeline Fink, Cameron P. Fink, Jenna K. Fink, Eliza G. Fink, and Amelia Fink; and three great-grandchildren, Jackson D. Truax, Gracie Truax, and Charlee Truax. A funeral service will be conducted 11 a.m., Wednesday, September 11, 2013, at Thomas Road Baptist Church with the Rev. Jesse D. Truax and the Rev. Dan Lee officiating. Interment with military honors by American Legion Post 16 will follow at Fort Hill Memorial Park. The family will receive friends from 6 until 8:30 p.m. Tuesday, September 10, 2013, at the Welcome Center on the campus at Liberty University. Those wishing to make memorial contributions are asked to consider the Liberty University School of Religion.